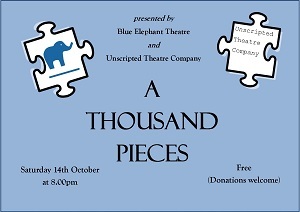 Unscripted Theatre Company and Blue Elephant Theatre present a night showcasing London’s emerging actors and musicians. From monologues to melodies, watch up-and-coming acts share bitesize performances…with the option to take to the stage yourself in the Open Mic section. Unscripted Theatre Company are a new company who aim to support performers to take the next step in their careers, whether it be auditioning for drama school or jumping into professional work for the first time. Join us on October 14th to discover the talent of tomorrow taking that next step. Tickets are FREE (although donations on the door are greatly appreciated), but should be booked in advance to avoid disappointment. Tickets can be booked here.